Once again, a bill promoting comp time is being paraded out by congressional Republicans and will be the subject of a hearing in the House this morning. The bill would allow private sector employers to offer comp time at time-and-a-half in lieu of overtime pay when an employee works more than 40 hours in a week. It is being touted by congressional Republicans as a boon to worker flexibility, but do not be fooled—everything the comp time bill purports to provide for workers is actually already available under the overtime provisions of the Fair Labor Standards Act. The bill only provides a new employer right to avoid paying workers the overtime they have earned. Here are a couple scenarios to show workers are never better off under the comp time bill. First, the easy example: consider the very common case of the low- or moderate-wage workers whose paycheck is not enough for them to make ends meet, and who would always prefer to work extra hours to get extra pay. Under comp time, these workers give up their right to overtime earnings in exchange for future time off. This is not what they need or want and they are unambiguously worse off under comp time than overtime. But what about a worker who doesn’t need or want the overtime pay and prefers the time—are they better off under the comp time bill than under current law which provides overtime pay for working more than 40 hours a week? Nope! At best they are back at neutral. The below examples also show that under the comp time bill, far from gaining flexibility, workers simply “loan” their time worked to their employer, interest free, until they are granted leave. Further, the employer can hang on to those extra hours for over a year. This means the loan from the worker to her employer can build up if the employer continues not to grant time off and the worker continues to be required to work overtime hours. And if the employer goes out of business before the worker is granted the time off? They are unlikely to be compensated for those extra hours at all. These examples also show that the Fair Labor Standards Act already allows an employer to grant time off to employees who work overtime. The comp time bill adds nothing for workers but delay and risk. Workers are never better off under the comp time bill: Consider a worker who typically works 40 hours a week for $20 an hour. During a normal two weeks, she makes $1600, and during a normal five weeks, she makes $4000. In the first week, earns $920 ($20 an hour for 40 hours plus $30 an hour— time and a half—for the four overtime hours). In the second week, works 34 hours and earns $680 ($20 an hour for 34 hours). In the two weeks combined, she earns $1600 for 78 hours of work. In the first week, she earns $800 for 40 hours, and banks 6 hours of comp time (time and a half for the four overtime hours). In the second week, works 34 hours but gets paid for 40 hours— $800 —because she uses the comp time. In the two weeks combined, she earns $1600 for 78 hours of work. This is exactly the same as under overtime! Comp time gives her nothing she can’t have under overtime. 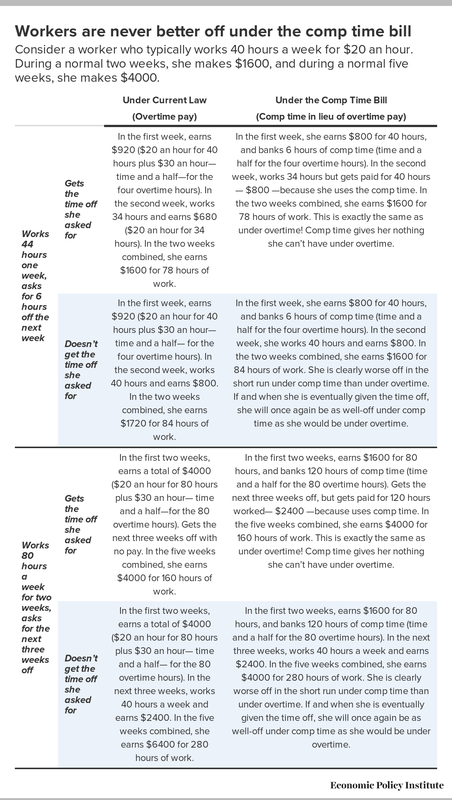 In the first week, earns $920 ($20 an hour for 40 hours plus $30 an hour— time and a half— for the four overtime hours). In the second week, works 40 hours and earns $800. In the two weeks combined, she earns $1720 for 84 hours of work. In the first week, she earns $800 for 40 hours, and banks 6 hours of comp time (time and a half for the four overtime hours). In the second week, she works 40 hours and earns $800. In the two weeks combined, she earns $1600 for 84 hours of work. She is clearly worse off in the short run under comp time than under overtime. If and when she is eventually given the time off, she will once again be as well-off under comp time as she would be under overtime. In the first two weeks, earns a total of $4000 ($20 an hour for 80 hours plus $30 an hour— time and a half—for the 80 overtime hours). Gets the next three weeks off with no pay. In the five weeks combined, she earns $4000 for 160 hours of work. In the first two weeks, earns $1600 for 80 hours, and banks 120 hours of comp time (time and a half for the 80 overtime hours). Gets the next three weeks off, but gets paid for 120 hours worked— $2400 —because uses comp time. In the five weeks combined, she earns $4000 for 160 hours of work. This is exactly the same as under overtime! Comp time gives her nothing she can’t have under overtime. In the first two weeks, earns a total of $4000 ($20 an hour for 80 hours plus $30 an hour— time and a half— for the 80 overtime hours). In the next three weeks, works 40 hours a week and earns $2400. In the five weeks combined, she earns $6400 for 280 hours of work. In the first two weeks, earns $1600 for 80 hours, and banks 120 hours of comp time (time and a half for the 80 overtime hours). In the next three weeks, works 40 hours a week and earns $2400. In the five weeks combined, she earns $4000 for 280 hours of work. She is clearly worse off in the short run under comp time than under overtime. If and when she is eventually given the time off, she will once again be as well-off under comp time as she would be under overtime.